The size of these grizzly bears will absolutely blow your mind. While a small number of grizzly bears live in the continental United States, they are much more common in Alaska and western Canada. 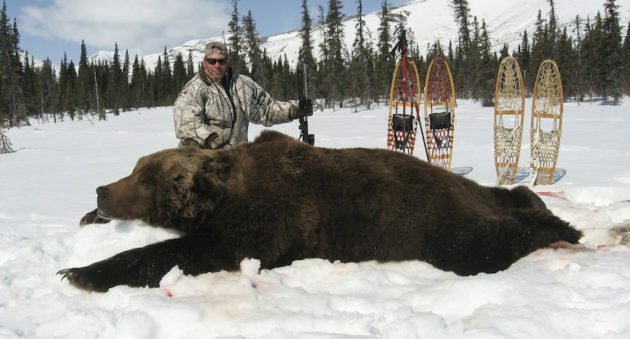 Not surprisingly, the biggest grizzly bear kills in each major record book (Boone & Crockett, Pope & Young and Safari Club International) were all hunted in Alaska. As you'll see in a minute, all of these bears were absolutely gigantic. Since they were all killed in remote parts of Alaska, we don't actually know what any of them weighed, though. While that information would certainly be nice to know, the major conservation organizations don't use body weight to rank the biggest grizzly bears. Instead, they score grizzly bears by measuring the size of their clean, dry skull. To score a grizzly, they measure the length of the skull at its longest point, measure the width of the skull at its widest point and then add the two measurements together for the total score. The Boone & Crockett and Pope & Young Clubs measure the size of the skull without the lower jaw, but Safari Club International measures the skull with the lower jaw. Additionally, though SCI and the Boone & Crockett Club both accept entries of "picked-up" skulls, this list only covers the biggest grizzly bears actually killed by hunters. Finally, the three organizations all separate the smaller, inland grizzly bears from the larger coastal Alaska brown bears for record-keeping purposes. However, they draw the dividing line in slightly different places. Safari Club International classifies all brown bears taken in Alaska's Game Management Units 1-10 and 14-18 as Alaska brown bears. The organization classifies brown bears from all other Alaska GMUs as grizzly bears. The Boone & Crockett Club draws the line using a more complicated criteria that generally follows the same boundaries, with one major exception: it defines brown bears in parts of Alaska's GMU 19 as Alaska brown bears instead of grizzly bears. For that reason, there is a bit of a discrepancy between the biggest grizzly bear kills in each record book. Make no mistake though: these are all really big bears that will make you want to carry bear spray or a good bear defense gun while you're out in grizzly country. Midway through his hunt near Unalakeet, Alaska, Rodney Debias and his guide suddenly encountered this massive grizzly bear at just 17 yards. Somehow, he managed to keep his cool during that hair-raising encounter and send an arrow into the bear's vitals. It dropped after running about 50 yards. Because Debias used lighted nocks on his arrow, the Pope & Young Club did not officially certify this as the world-record grizzly bear until after they changed their rules to allow lighted nocks a few years ago. However, this old bruin is now the biggest grizzly bear ever killed by a bow hunter. He was also the biggest grizzly bear ever killed for a few years until Shane Swiderski and Bob Steed killed their grizzly bears in 2013. Bears get big by being smart and cagey, but even the biggest grizzly bears make mistakes every now and then. That's probably what happened with this enormous grizzly bear. Shane Swiderski stalked to within 70 yards of the bear without being noticed and took his shot. With a skull measuring 27 and 6/16 inches, this is the biggest grizzly bear ever killed by a hunter in the Boone & Crockett record book. It fell 7/16 of an inch short of the current overall Boone & Crockett record grizzly bear--a skull found in Alaska back in 1976 that measured 27 and 13/16 inches. When Bob Steed and his guide encountered this grizzly on an early spring hunt in Alaska, they immediately knew he was in a league of his own. After stalking to within 200 yards of the bear, they found him feeding on a moose carcass. Bob made a couple good shots with his rifle to bring it down. This is the biggest grizzly bear ever killed by a hunter in terms of skull size. Additionally, its hide squared over 9 feet, and biologists in Alaska estimated this gigantic bruin was more than 20 years old. That's a grizzled, old monster of a bear if there ever was one.